The 4-person Kaitum 4 and Kaitum 4 GT join the Kaitum family in the all-season Red Label series, and the popular three-season Yellow Label Anjan, Anjan GT and Rogen get a facelift. 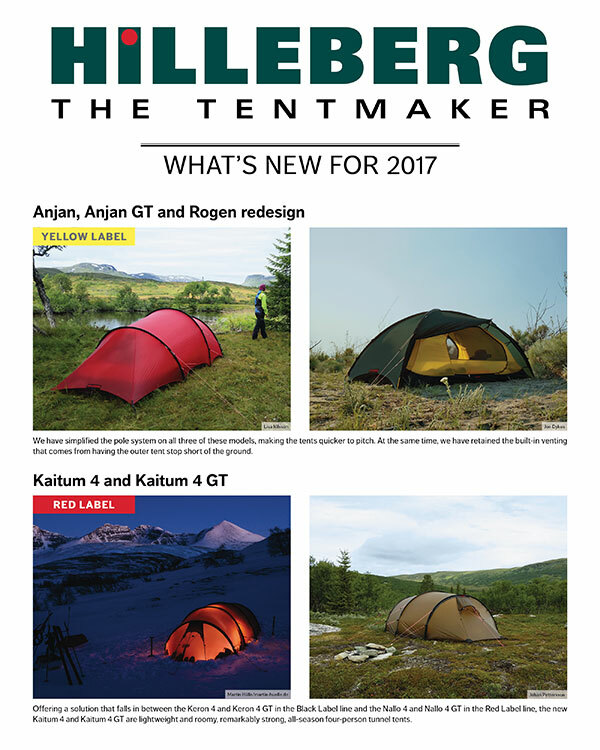 Frösön, Sweden – Hilleberg is adding the Kaitum 4 and Kaitum 4 GT models to the 2017 line to expand the company’s offerings of 4-person tents. The 2- and 3-person Kaitum and Kaitum GT models have long been popular with all-season backpackers and climbers because of their roominess and light weight. With the new Kaitum 4 and Kaitum 4 GT, adventurers needing larger, 4-person all-season tents now have more options. Both are roomy, two entrance, two vestibule tents. The Kaitum 4 has two standard sized vestibules, while the Kaitum 4 GT has one standard and one extended vestibule. Like the one entrance, one vestibule Nallo 4 and Nallo 4 GT, the Kaitum models are in Hilleberg’s Red Label line of all-season tents that are ideal for trips in all climates where low weight is a priority and where the conditions may be all but the most challenging. Both the Kaitum 4 and Kaitum 4 GT are excellent choices for backpacking families, for couples who camp with their dogs, or for anyone looking for a roomy but remarkably lightweight 4-person tent. The Kaitum 4 has an interior area of 4.6 m2 and two 1.6 m2 vestibules. Weight is 3.9 kg. The Kaitum 4 GT’s interior is 4.8 m2, and it has one 1.6 m2 vestibule and one that is 3.4 m2. Weight is 4.6 kg. The Anjan, Anjan GT, and Rogen were Hilleberg’s first ever three-season tents originally introduced in 2012. They are designed specifically as very lightweight tents that can handle all types of weather in warmer, snow-free conditions. The single vestibule Anjan models are well-suited to mobile adventures where a high space to weight ratio is important, and the Rogen is a remarkably lightweight, all-around, two entrance, two vestibule dome tent. For 2017, Hilleberg is redesigning all three of these models, replacing the dual opening pole sleeves and Lock-Tip poles with single opening sleeves and standard poles for quicker pitching, especially in windy conditions. All three offer full weather protection in varying three-season conditions, as well as plenty of ventilation for warmer days and nights. Mesh inner tent doors in all three tents, and a mesh vent in the back wall of the Anjan and Anjan GT’s inner tent, along with catenary patterning at the bottom of the outer tent walls allow full-time air flow. For even more venting, in both the Anjan and Anjan GT, the rear wall of the outer tent can be fully rolled back, and the Anjan’s front vestibule can be completely rolled to the side. On the Rogen, both vestibules can be either fully or partially rolled away. All three are excellent choices for three-season backpacking trips and summer bicycle or paddling tours. And with all of them, warm weather comfort seekers can “size up” and still keep the weight very low. Both the Rogen (2.1 kg) and the Anjan 2 (1.8 kg) make a deluxe solo tent, and the Anjan 3 (1.9 kg) is lightweight luxury for two. Even the Anjan 2 GT (2.1 kg) and Anjan 3 GT (2.3 kg) are surprisingly light – yet huge – solo shelter options for those who hold spaciousness in the highest regard. 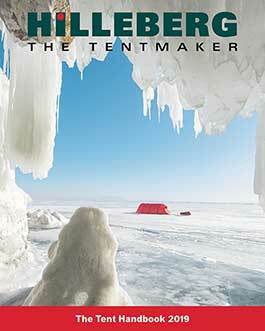 Founded in 1971, Sweden-based Hilleberg the Tentmaker is a family-owned company that manufactures lightweight tents of the highest quality for every season. The company is known for setting the standard in making tents by employing the lightest, yet strongest materials, by using double wall construction, and by setting up and inspecting every tent in their own European factory to ensure the ultimate in quality and safety. The company is still very much a family affair: Bo Hilleberg is Chairman of the Board, and heads up the product development team; his wife, Renate and their children Rolf and Petra comprise the company’s board, and Petra is CEO of the Hilleberg Group as well as President of the US-based Hilleberg, Inc.